thewonderwound: A Conspiracy of Alchemists. A Review. A Conspiracy of Alchemists. A Review. With a name like ‘Chance’ expect magic to happen. 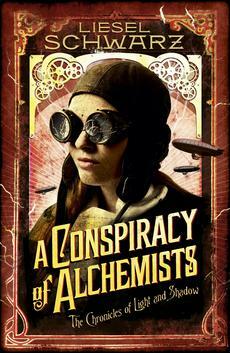 A Conspiracy of Alchemists: Chronicles of Light and Shadow marks the first of Liesel Schwarz’ steampunk trilogy, set to take the world by storm. Schwarz’ debut novel, set in 1903, as the very first line imposes, immediately transports the reader to the Victorian era. Yet, there is something magical in the air: that strange kind of uncanny that is both familiar and excitingly new. This isn’t just the turn of the century we read about in History, but a world that we wish existed, where supernatural creatures walk among us. As the title suggests, there is a split between Light and Shadow, good and evil. Scientific and technological advance takes society into a new golden age through utilizing magical energy. However, this light threatens the supernatural, and, out of the dark rises the Alchemists and the Nightwalkers, preparing to take back control and submerge the world, once again, into darkness. Original and refreshing, the story is a wonderful combination of the nineteenth century novel and quirky twenty-first century humour and language. The protagonist is a female lead to be admired: she is inventive, strong and intelligent, yet has a vulnerability about her – the perfect modern day woman who does not allow a male-dominated society to limit her potential or constrict her. Opposite her stands Marsh, and immediately women swoon. He is the Rochester-like male lead that every good novel should have: he is, at times, condescending and somewhat arrogant, but, like a force of nature, is irresistible and appealing. Like getting to know the love of your life, the more his character evolves, the more the readers take a shine to him. Inevitably, Marsh will be the first literary love of female readers of younger generations, just as Darcy and Rochester have been the first love of many female readers today. Despite, two wonderfully created leads, the author does not fall into the trap of two-dimensional secondary characters. The ‘supporting cast’ are equally as thought-out, and original. Still, the author does not give away all secrets to supernatural creatures, but allows us to see they are something complex, and we will have to discover them the same way we do with other characters. However, many readers will be happy to know that Vampires are not portrayed in the same way as recent popular fiction/television/film would have us believe, and the author does not deviate back to the original Bram Stoker-style Vamp either. Instead, she creates, what seems natural and logical for Vampires to be. And faeries too. Schwarz does not over-do the world she has created, but allows us to be pulled in, and excited by the opportunity of exploring. She is subtle in building up characters and the Shadow, but keeps something back to amaze us with as the series continues. The novel is accessible, and appealing. The use of language is good, and should be a pointer to some other popular writers: you can be original and compelling, without lowering standards of language. The author is humorous, and forces the reader to keep re-reading until the next installment is published.